An estate built for Henry Ford II in 1960 has recently come on the market at $175 million. Located on Jule Pond in Southampton, it is currently the most expensive listing in New York and has the largest ocean frontage in the celebrity-infused Hamptons. Henry was the grandson of the famous automaker and was responsible for reviving the failing company in the late 1950s and growing it into far-reaching international markets. Towards the end of the 19th century when rail lines opened the connection between the Hamptons and New York City, the moneyed class began flooding the Hamptons’ villages and beaches in the summer months. Every year, more of America’s elite celebrities, business leaders and families made the Hamptons their home from Memorial Day to Labor Day. The grand event in the summer of 1940 was the marriage of Henry Ford II, the eldest son of Edsel Ford and eldest grandson of Henry Ford, to Southampton socialite Anne McDonnell. Along with the Hamptons ideal beaches and growing reputation as the summer place to be seen, the wealthy began building their trophy vacation homes there – sometimes nicer than their main homes. The Fords would soon have their own summer home, one of the original Victorian homes on the island – Halcyon Lodge. In 1951, they commissioned Modernist architect Philip Johnson, famous for his Glass House in Connecticut and the Seagram Building in Manhattan, to add a contemporary glass addition to traditional Halcyon. It was quite possibly the most extreme example of home-design yin and yang in North America. By the late 1950s, the Fords decided to build a larger home on 235 Southampton acres, which they named Fordune, that was completed in 1960. After their divorce in 1964, sections of the Fordune acreage were sold off reducing the estate’s size to 42 acres. The estate sold in 2002 to Brenda Earl, a former partner at Zweig-Dimenna hedge fund. After spending many millions on restoration, Earl is now selling the estate. With nearly a quarter mile of Atlantic Ocean frontage and access to three ponds and Mecox Bay, Fordune had its major renovation in 2008. Now known as Jule Pond, great care was taken to preserve Fordune’s exceptional original details such as distinctive ceilings with moldings and traditional chandeliers, Italian marble fireplaces, French parquet floors, and antique bathroom fixtures, most of which were imported from Europe. Entering through a gated entrance down the long, tree-lined driveway, the white stucco mansion of approximately 20,000 square feet was intentionally designed with a modest entrance so that the interior elegance and layout would delightfully surprise visitors. From the dramatic foyer with its sweeping staircase, the view ahead takes in the southern view of the grounds. There are three wings: one with a chef’s kitchen, the next a library and the third and longest wing includes staff and guest rooms with an outside entrance. There are 12 bedrooms and 12 baths, a 48-foot living room, an outdoor kitchen, 20-foot pool, tennis courts, basketball courts, spa, greenhouse, a carriage house and four-car garage facing the servant’s quarters. Today, Southampton is one of the wealthiest zip codes in the country and attracts what’s left of old money as well as celebrities from actors to designers, writers, musicians, Wall Street wizards and more. Celebrity residents include Jimmy Buffett, Paul Simon, Jerry Seinfeld, Gwyneth Paltrow, Jon Bon Jovi and Steven Spielberg. The main mansion of Henry Ford II’s grand Southampton Fordune estate with its own 42-acres and 1,286 linear feet of ocean front is now for sale as New York’s most expensive home, priced at $175 million. 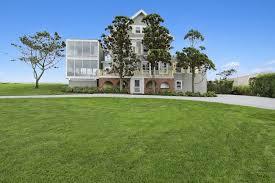 Bespoke Real Estate in Water Mill, New York holds the listing.